Game design is hard. That's why your students should do it. For the past couple of years I’ve been researching classrooms where teachers and students have taken on game design as a vehicle for learning. I've read extensive international research (and some rhetoric) on games and game design and its potential for learning. I’ve befriended game developers, and lurked curiously in their conferences and online groups, And I did the most challenging and humbling thing of all: I worked with others to design a game. Now, when I talk to teachers new to game design about why they should consider supporting their students to do it, I start with this reason: "because it’s hard". Not hard as in “don’t do it”, but hard as in “that’s why it’s worth doing” - the same way John F. Kennedy talked about going to the moon in 1962. I’ll admit going to the moon might be a little harder, ok a lot harder, than designing a game. But unlike going to the moon, designing a game is something that’s certainly within the capabilities of children when they have the right tools, support, and timeframes to achieve this. Based on what game-designing students and teachers say, it’s definitely one way to “organise...the best of our energies and skills” in a classroom, and for many young people it is a “challenge [they are] willing to accept”. Teachers, or any adults, who have never tried to make a game (digital or otherwise), may not understand why game design is so challenging, and thus so worthwhile. Adults who are leery of games may especially underestimate the rich learning opportunity that game design offers. In my next few blog posts, I want to explain some of the things I’ve learned about “learning through game design”. I want to share some of the benefits that teachers and students can gain through this process, as well as some of the reasons why game design is challenging in any setting, and may be an especially challenging thing to do in schools. Here’s one of the big reasons game design can be a scary proposition for schools. At the heart of game design lies a truly iterative design process. No game can be devised and created by mapping out a plan from start to finish. All game designs start with an idea, or several ideas, that have to be prototyped, tested, changed, retested, tweaked, and refined through many cycles of playtesting. What I have observed is that many adults struggle to truly embrace what "iterative design" really means in practice. I’ve noticed this amongst teachers, researchers, policymakers, and many other professions where iterative design is not the way we have been taught to do things. We may be much more comfortable with a linear process that gives us a feeling of security that there are clear steps, stages, and outcomes to get from A to Z. Even those of us who support the idea of iterative design “in principle” can find it challenging - even scary - to operate this way. Not only is it hard to predetermine what the final outcome might look like, it’s also hard to predetermine the exact order of steps and the pathway that it will take to get there. It means being able to trust in the process, and not be put off by uncertainties and ambiguities along the way. (I know how hard this can be - I have been there myself!). In the Games for Learning project, we’ve seen how important it can be for teachers to feel supported by their peers and colleagues, or to find like-minded teachers or researchers. Teachers need support when they are feeling uncertain about what to do next, or when “the pressure is on” for students to complete a game, and expected timeframes bear little resemblance to reality. In my next post, I’ll get into more detail about the game design process, what that can look like in the classroom, and what teachers and students in the Games for Learning had to say about it. If you've ever designed a game, or supported students to do game design, does the post above reflect your experiences of the process? Let us know what you think in the comments below. Login to follow this blog post. This is awesome. As both a teacher and game designer we need to be having these kinds of conversations more often because learning through play is what we do as human beings. Playing with play (i.e. 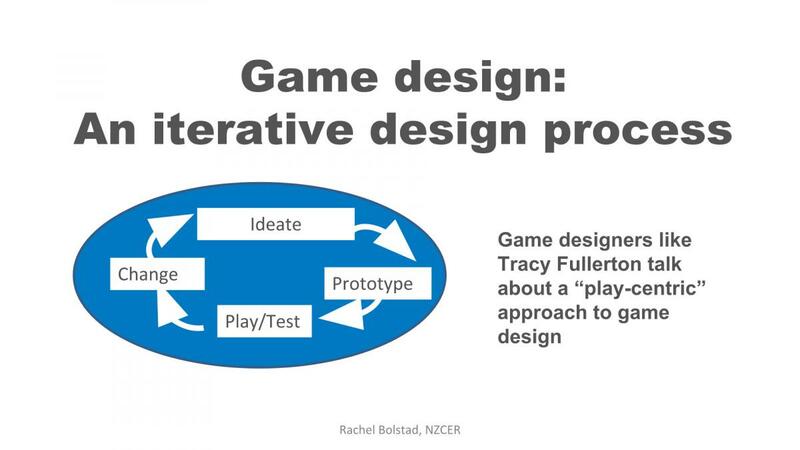 game design) is a really good process to leverage because game design requires systemic thinking about the subject matter which involves much deeper learning. The one (minor) issue I take with the blog is in the "What progress in game design looks like" bit. Often the spiraling "progress" stops early on and starts again because a fundamental flaw has been identified in the core design, usually several times over. This is a good thing that iteration picks up on early, so that rather than continuing on and wasting time (sunk cost) with a flawed foundation, the process can shift early on to a better foundation. From an educational point of view, the game design itself isn't what's important, but the process of learning is improved because flaws in initial understanding are highlighted and addressed, often without triggering cognitive defense mechanisms (e.g. cognitive dissonance, backfire effect) so that better learning can take place. As part of that it also sets up better practices for *how to learn/think/analyse* which is so critical right from birth (but it's sometimes only really introduced at tertiary level). Maybe we need a few more sketches Tim! I agree yours is a more nuanced description of the process and digs a bit deeper. One of our teacher colleagues asked her primary school students to draw their interpretation of the game design process at the end of a year in which they had done all sorts of experimentation with game-based learning. I didn’t see the drawings but I think all the students had their own perspective on the non-linearity of the process or what the hard bits looked like. Another teacher surveyed her Intermediate class at the end of the year to get their input on what the hardest parts of the process were. Interestingly the biggest challenge by far was working with other people, as they formed teams to design their games and while they realised the strengths different people brought to the process, being able to negotiate different ideas or opinions throughout the iterative process was not easy! I would say in my own teeny tiny experience designing a game that part was challenging for me too, to not be fixed on my ideas being the right ideas and to be patient when it felt my codevelopers and I were in disagreement! One of the nice comments from a Masters student of mine here in Norway was that the undergraduate degree felt like the students were Beta testing everything. This was because we were constantly trying new approaches and responding to changes. We have also looked at the benefits of getting patients to make boardgames about their conditions. What are the choices a player has in the board game of Diabetes? It is not playing the game that is most educational, but the process of designing the game, where the designer has to work out what the options should be and what effect they have. This allows the patient to think about their condition from a completely different perspective. The design process helps identify much deeper interactions that students normally perceive because they have to dig deeper and understand not just the description of things, but the interactions between humans and those things. That work with patients designing board games sounds really interesting! Thanks for sharing that. While computer game design obviously requires an understanding of computer resource development and programming it seems to me that good game design is something children understand quite quickly. A good game encourages continued participation and definitely resolves through skilled use of legal actions and or a time limit. That may be a constrained form of physical chasing as much as a board game. Children are perfectly acquainted with meta level concerns like 'cheating' , 'exclusion', 'onboarding', and 'losing hope/anger' from a young age. Recognising these qualities of play is a critical part of the design process. Thanks Peter, I agree with you! I think game design is actually harder for most adults than it is for most young people and as you say can emerge very easily from play. One of the things we've heard from teachers is how much existing game knowledge their students have once there is space for thinking and talking about games and game design in the classroom. I really love the way that game design can provide an opportunity to recognise and value things children already know from their own experiences, and see how that knowledge becomes a great resource for design in the classroom. So game design is both easy and hard - though I think those who dismiss games probably haven't recognised the sophisticated depths of game design as a process. Please refer to the NZCER blogs guidelines for participation on NZCER blog posts.